Shinobu Wakamiya – alone in a crowded room. 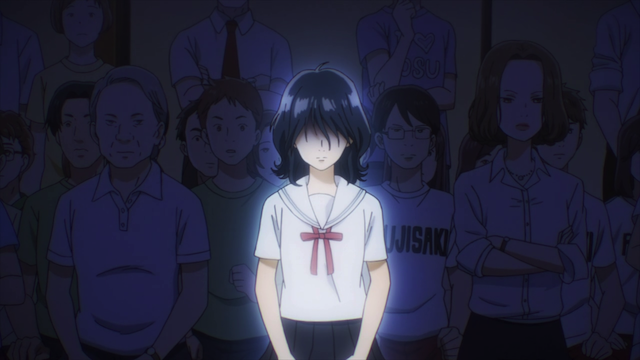 Chihayafuru season 2 episode 18 is a continuation of the final match of the high school team Karuta championship. There was enough give and take and enough tension to keep me thoroughly engaged (and anxious to see the conclusion), but as intense as that story was, there was another, fascinating story taking place out on the sidelines. Shinobu Wakamiya, the reigning Queen of Karuta watches the match between Chihaya and Rion, and a series of emotions washes over her. Outside the room, Arata Wataya provides some explanation: people who are deeply involved in Karuta might view the individual matches as the real game, but without the team matches and all of the other ancillary activities, Karuta would die out. Meanwhile Shinobu, a consummate loner, inwardly finds the source of her awkwardness. Instead of helping her fit in, instead of merely being a consolation for a lonely girl, her Karuta has isolated her from other people. She doesn’t like team matches, but not just because they are a waste of time … not just because she doesn’t get along well with others … she was molded into a loner by adults who wanted to prevent her natural desire to have friends from diminishing her killer instinct. I have mentioned before that “shinobu” is another word for ninja. Shinobu’s playing style is described by Chihaya as “silent”, and several times in the past few episodes they used Shinobu’s ability to suddenly appear beside people to comic effect. Now there is another way that Shinobu is a character that references popular notions of ninjas: she was socially isolated as a child as part of her training to become the Karuta assassin she is today. I’m not going to speculate on what will happen in the individual tournament. There is a very real chance that Chihaya won’t be able to play against Shinobu, which is the one thing I was DYING to see this season. … I just can’t think about that right now. They certainly are in a tough place, but a comeback isn’t impossible. If I remember correctly, Taichi has twice as many cards as his opponent. Chihaya would probably be in a good position if it weren’t for her injury. Tsukuba is already out of it, but Nishida could still rally. Such a tense match, I’m actually surprised they managed to drag these matches out for so long and for me not to feel that it was dragged out. My compliments to the series for planning out so well. I don’t think we’ll see a Chihaya vs Shinobu match, would’ve been great but I believe, or probably hope rather, that they’ll win the team tournament and then they’ll watch a bit of the individual tournament and not play. Though I can’t remember what the original plan was, I don’t think they planned to play in the individual one? What I’m hoping for is that this season lasts more than the standard 24 ish episodes and we do see the individual tournament in detail. And definitely hoping that one involves Chihaya. I think we probably will see the individual tournament in detail, but I fear Chihaya won’t be a part of it. I think there is a chance that Taichi will have a good showing, though. It will also be good if Arata comes back as a full-fledged Karuta player; he is slowly creeping back into the story, but it would be good to have him fully integrated into the main storyline. Then Season 3! I demand it, and so it shall be.